The new issue of PhotoPlus: The Canon Magazine is on sale now (as well as arriving in subscribers' postboxes) and it’s a real beauty of an issue. In our Canon DSLR Starter Pack, we help you get to grips with your new EOS camera and learn basic Canon camera craft. There’s also great techniques for those more advanced amateurs who need to refresh their Canon camera skills. Our Apprentice spends a lovely morning learning how to photograph lavender fields, from sweeping scenes to creative close-ups, with great Canon pro Guy Edwardes. We also interview artistic family portrait photographer Helen Bartlett, who specialises in captivating black-and-white portraiture. We're also giving away a free 74-page Photoshop guide to download to help you learn to create special effects! In our inspirational Canon Skills section, new photo projects include photographing underwater, simple still-life home studio setups, and street photography tips, new image-editing tutorials, plus all come with free video guides so you can follow along and learn at your own speed. We have some expert advice for you in this month’s Canon School with tips on how to make the most of bracketing for better exposures. Furthermore, in our Gear section, we test eight of the latest photo-editing software packages, and you may be surprised which comes out on top, plus Sigma’s brand-new 105mm f/1.4 DG HSM Art lens gets tested. 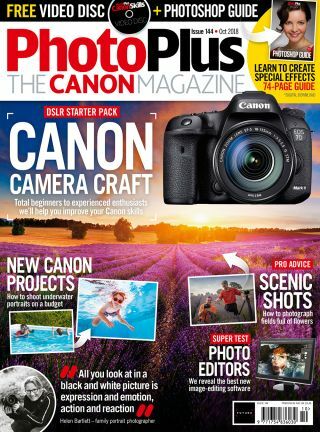 PhotoPlus: The Canon Magazine is 132 pages of essential Canon techniques, reviews, news and inspiration – out now at all good newsagents and supermarkets, or make sure of your copy every month by subscribing at our online shop from just £28 from six issues! PhotoPlus has just launched a free weekly email newsletter that'll deliver 100% Canon-focused gear news, techniques and exclusive offers direct to your inbox every Tuesday. Sign up to get the PhotoPlus: The Canon Magazine email newsletter here.